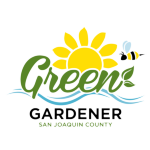 San Joaquin County Green Gardener! See BELOW for topics covered in each module. For additional information, call 209-953-6109. Week 1: Irrigation: How much water does a landscape really need? Attend all evening sessions, 2 half-day Saturday workshops and pass a final take-home exam to receive a certificate and participate in free marketing by the County including being on the County's website list of Qualified Green Gardeners! Like I said? I was thinking. I had forgotten that I explained to her how the water could be more evenly absorbed in uneven terrain with a change like this. As she made her way back into the house I was feeling more like a professional because what I told her seemed to have made a significant difference. I added a new client to my list this spring almost solely because I advertised as GREEN GARDENER certified and he did some background on me and the program... So that was money well spent! Thank you so much for all the efforts you made to share your knowledge with us. If I were to have to choose between having my name on this Green Gardener certification list (which was a compelling reason for me to sign up for the course) or having the knowledge gained from the class I would now choose to have the knowledge, because I see its value now so much more than I did before the class began. This class has changed my mind about landscaping. Before the class began the name Green Gardener or any other name/terminology that is associated with change & restricting the status quo or anything that has always been done a certain way, just sort of irked me. Now after taking the class I have been much relieved of that inner resistance by hearing the reasonable purposes and solutions for the changes from traditional gardening to green gardening. More respect and less suspicion is what I seem to have for those who translate what the environment is telling us. Believe it or not on the first day of class I turned to another class mate and said "I wonder if this will be worth it". I knew the dollar amount we each paid for the class was a good deal, but was it worth our time? Well I now know that the answer is that it was worth it. Now I find myself having more straight forward answers for my customer's landscape questions whereas before, if I did have an opinion on a matter, I didn't have a whole lot of confidence to go with it. Since the class has begun I have come to a more refined realization as to the type of clientele I would like to obtain (sustainable) vs. those I would rather shy away from (high maintenance).